What is “the cloud?” You hear a lot of people using the term – sometimes in a positive way, sometimes in a negative way. It’s become one of those buzzwords that everyone uses, but not everyone can define. Well, that’s about to change for you. Here’s a handy beginner’s guide to the cloud. Use it wisely. The cloud isn’t a thing, exactly. It’s a network of servers. They’re all connected together, they each store information, and they all have different functions. Some store data or apps, some deliver a service. There isn’t just one “cloud,” either. There are many different cloud networks connected together to do different things. A whole sky full of clouds? Yes, exactly. If you’re using social media or any kind of online storage (Google Drive, for instance), you’re using “the cloud.” You just may not have realized it. Every time you – say – upload a photo to Instagram, you’re uploading it to a server on the cloud. Any time you store information on a website and don’t use up any space on your own hard drive or data card....you’re using the cloud. Google Drive? Evernote? iCloud? SkyDrive? All clouds. All good. The best thing about the cloud is the cost savings it offers. Now, companies don’t have to buy their own expensive hardware and processing equipment. They can pay for exactly as much space on the cloud as they need, and store their data offsite. If they need more space, they can scale up. If they need less space, they can scale down. In addition, cloud-based web hosting is an incredibly cost-effective and flexible way to keep your site on the web. Shared, cloud-based hosting solutions can scale with the changing requirements of growing businesses, and are perfect for high-traffic blogs and corporate websites, small businesses or e-commerce platforms. Essential points: The cloud is super flexible. It also saves companies lots of equipment and other costs. What’s not to love, really? 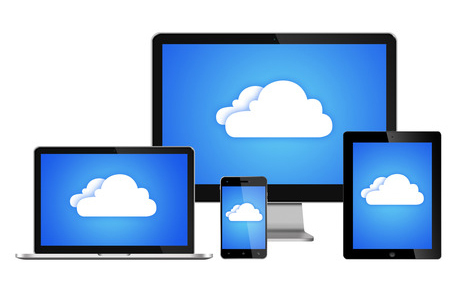 Some of the fastest and most efficient cloud storage services are listed here. All the cloud networks together store an insane amount of data. Nobody knows exactly how much storage space is up there, but we think it’s about 1 Exabyte, the equivalent of 4.2 million Macbook Pro hard drives. Way back in the dawn of time, “mainframe” computers used to be so big they took up a whole room. Companies often couldn’t afford more than one of these computers, so they worked out “time sharing” programs that allowed each employee to share data access and CPU time. Those 1950s time sharing programs are the base of today’s “cloud” concept. Then, in 1969, a genius named J.C.R. Licklider developed the Internet prototype ARPANET (Advanced Research Projects Agency Network) in order to share data and programs across multiple locations. However, it wasn’t until the 90s that the Internet developed enough bandwidth to make the cloud widely available. In 1997, Professor Ramnath Chellapa coined the term “cloud computing,” and two years later Salesforce became the first site to deliver Internet-based software and apps. Then in 2006, Amazon got in on the act with a new cloud computing platform called Amazon Web Services (AWS) that powered traffic and data for thousands of companies. AWS is still going strong – if you use Instagram or Pinterest, you’re using an AWS-based site. Once upon a time, the main “cloud” concern was “Is the cloud reliable?” Now that it works just as well as any other storage option, more people have started to worry about cloud security. Is information stored on the cloud really “safe?” Can the government see sensitive data. Google has recently addressed these concerns by announcing that it will automatically encrypt data for all paid cloud storage users. That’s a good start, but obviously many questions remain. People who want to “move out of the cloud” may find some of these tips useful. To learn more about cloud safety, and how it can affect your business, check out these other articles.